You are here: Home / B2B Digital Marketing / Landing Pages: Increase marketing ROI / Landing Page Resources / Landing Page Best Practice Guides / How to pick the best landing page creator for your business? If you want to increase marketing return on investment (ROI), then you are no doubt already aware of the importance of landing pages. The use of landing pages can increase conversions by 55% (HubSpot). In this article, we’ll help you find the best landing page creator for your business, or you can go ahead and use our wizard to pick a landing page creator based on your business and marketing needs. Why do landing pages work so well? Landing pages focus visitor attention on converting, rather than wondering off. Landing pages are made with one goal in mind and focus on that goal. In the world of landing pages anything that doesn’t support the single goal, is a distraction. A recent study showed that even navigation bars are a distraction, with the removal of navigation resulting in a 28% (ConversionXL) increase in conversions. I already have a landing page, do I need more? Landing pages increase campaign ROI and the more landing pages a business has, the better marketing campaigns work. So why don’t all companies use landing pages? It turns out that the most significant barrier that markers have is lack of expertise and access to easy to use tools. The marketing teams that are winning are decentralising the process of creating landing pages and enabling each marketer to build their own. That may sound like a leap, but with the right landing page creator, building a high converting landing page is as easy as using PowerPoint. How do I pick a landing page creator for my team? 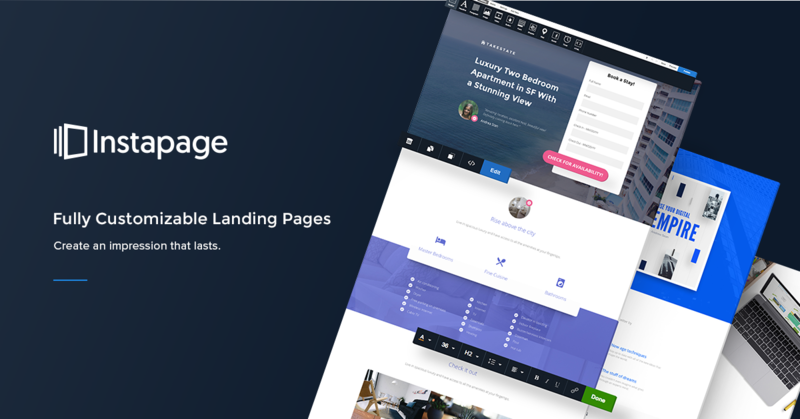 With the right landing page builder, you and your team can review and publish landing pages without needing to pay an agency, wait for a developer or involve IT. The question is, which landing page tool is right for your business? There are dozens to pick from and selecting a landing page creator can be confusing. Here are some things you should consider when choosing a landing page builder for you or your team or jump straight to our selection wizard and instantly discover the right one for your business. If you are investing in a landing page creator, you are doing so because it’s going to help you build more landing pages, quickly. You’ll no longer need a developer to build landing pages or your IT team to publish them. For marketers and business users to create landing pages, the builder needs to be very easy to use, if not it won’t be used and you’ll miss out on the benefits. We live in a mobile world. Your prospects will be researching their next purchase on their mobile, and in many cases also completing the transaction online. If you send out an email to your list, no doubt many of the recipients will receive that email on their phone. It’s imperative that when they click your call to action, being on a mobile device isn’t a hindrance. Any marketing technology you invest in needs to integrate with other platforms you use. As a minimum, the landing page builder needs to be able to pass leads to your CRM, unless the builder comes with an integrated CRM. Even with an integrated CRM you must be able to move data out. The more capable landing page platforms come with Zapier integrations. Zapier is a platform that sits between multiple applications and simplifies integrating them. The process of creating landing pages may start with a template or blank canvas, but adding new elements should be as simple as dragging and dropping modules. As you add new components, you should be able to see your page come together. For the process of creating landing pages to become as efficient as possible, we need to be able to re-use what we produce. For example, if you spend time creating a new layout for displaying a video, you want to be able to re-use that layout, not re-create it each time. It’s incredible how many landing page tools force the user to re-create rather than re-use. If you want to increase productivity through re-use, then this will immediately disqualify many landing page builders. Landing pages are single pages with a single goal. By leveraging multiple landing pages it’s possible to take prospects on a step-by-step nurture journey. This step by step journey is a sales funnel which helps the prospect make a purchasing decision. It’s possible to set up multiple connected pages in any landing page builder where you can create more than one page, however, there are a few landing page creators that are designed with sales funnels and nurture journeys in mind. If you want to create a sales funnel, this is the landing page platform you need to consider. If you want to change headings and content on a page without needing to craft an entirely new page, then Dynamic Keyword Insertion (DKI) is the functionality you need. With DKI you can change page titles and more to match the terms your target audience uses when they are searching.